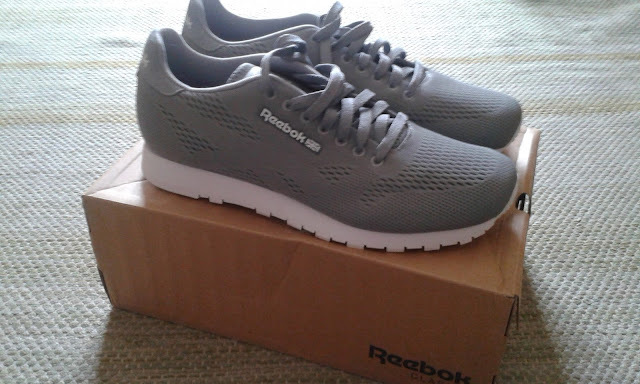 Just in time to celebrate my 1-year running activity, this morning I received the new Rebook shoes I had ordered online some weeks ago from the English eBay (at a cost of 30 pounds, plus 10 pounds shipping costs). All in all, I'm satisfied with this price: the ones I longed for (electric blue color) are still available on the Internet, but they cost more than 80 euro, so I think these nice grey Reebok I bought are a good bargain. The model is the V62609, very light, elegant and breathable. Compared to the version I am currently wearing, the single shoe is 20 grams lighter, a factor that should increase my running speed. Moreover, I think that my foot will sweat much less during the summer season. Of course I am looking forward to trying them on! I will write a longer review in a couple of months, but my impression is that they will perform quite well in the near future!